Most Twizy drivers will struggle to achieve 125 [wall] Watt-hours per mile and a range of 50 miles in a hilly area like ours. There are two important numbers governing the range and speed of a Twizy – 30 and 50. If you drive a Twizy at 50 mph (its maximum speed) whenever you can, and otherwise as fast as conditions allow, you might get 30 miles. If you drive at 30mph on flat roads whenever you can, and at whatever speed the same power can maintain at other times, you can manage well over 50 miles unless the terrain is against you. To understand why speed has such an impact on energy consumption, we need to know where the energy goes: some is lost as heat in the conversion from electrical to mechanical energy; a fair bit to the tyres; a fair bit to the drive-train, gears, bearings and brakes; and some to the control systems and (at night) the lights. Most of the large power drains increase roughly linearly with speed, so although you use twice as much to go twice as fast, it shouldn’t affect how far you can go because you take half the time. But above about 10mph you are also subject to air resistance, whose force increases with the cube of the speed, which means that the power to overcome it goes up with the square. 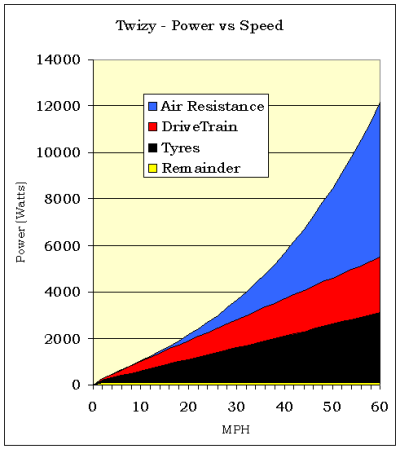 So by about 50mph pushing the air aside is accounting for at least half the power expended while at 25mph it accounts for less than a quarter. The (purely illustrative) figure below models a typical “power budget” you might expect to maintain a Twizy at a constant speed on a flat road. The graph above is of course over-simplified, and certainly not taken from any official Renault figures! 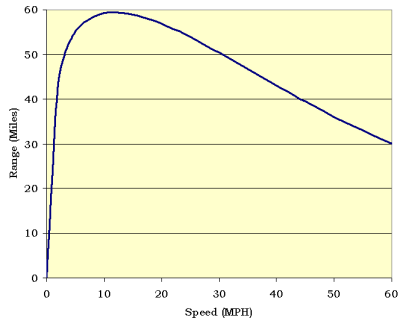 But as a model of Twizy performance it does roughly coincide with what we achieve in practice, and the same model produces the following graph of expected range at a given speed on a flat road. But of course, our roads are not flat, and we do not drive at a constant speed. We accelerate and we brake, and we climb hills and come back down again. I’ll have a look at the power cost of these in the next article. This entry was posted in Technology and tagged energy, kWh, range, Renault Twizy, speed. Bookmark the permalink.